Zambia is one of the many countries that participated in various economic diplomacy events in Davos where the World Economic Forum or WEF is progressing. This is according to First Secretary Press and Public Relations Kellys Kaunda who adds that His Excellency Anthony Mukwita represented the Zambian embassy in Germany at the invitation of the influential P4G and Africa Greenco CEO Anna Hajduka. “One of the ideas is to discuss how public-private partnerships can accelerate solutions to achieve the Global Goals, with a focus on clean energy,” said the Africa Greenco CEO who shared the platform with Ambassador Mukwita at the crucial Davos special event that attracted some more than 60 business leaders and government officials in one room. 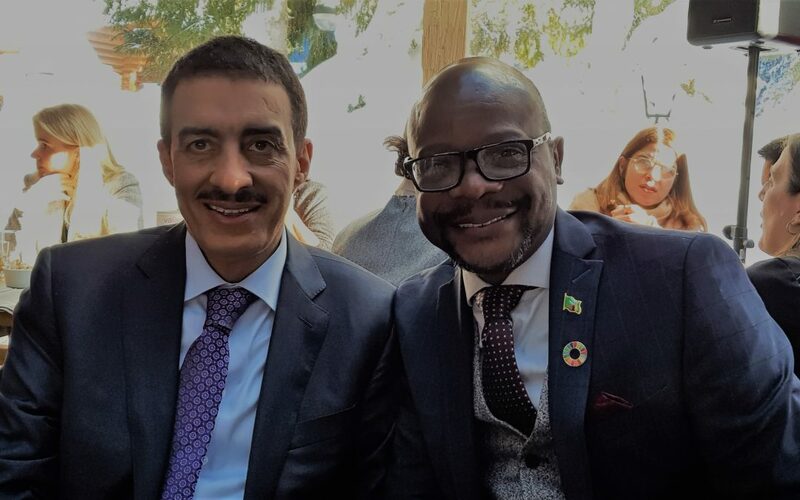 The event was hosted by SAP, the Islamic Development Bank President H.E Dr Bandar Mohamed Hamza Hajjar and P4G (Partnering for Green Growth and the Global Goals) and Project Everyone at Davos House. In 2015 to 2016 Zambia is one of the southern African countries that suffered adverse effects of Climate Change prompting President Edgar Lungu’s government to pursue progressive ways of mitigating the effects in future. The showcased partnership was Africa GreenCo which is seeking to work with the Government of Zambia, ZESCO, IDC, ERB, OPPI and other energy sector stakeholders to deliver systemic change in the renewable energy sector in Zambia and the SADC region and whose vision is: To lead innovation and sustainably transform renewable energy markets in Africa in partnership with the public sector. GreenCo envisages to be a government co-owned, independently managed and well-capitalised intermediary off taker to sit between small to medium scale renewable energy IPPs on the one hand and utilities and other power purchasers on the other. GreenCo addresses a key impediment to developing sub-Saharan Africa’s renewable energy resources at scale – the creditworthiness of off takers. CEO Hadjuka believes that if allowed to progress, “it will crowd in commercial financing, which is needed to reach the quantum of funding required,” and narrow the energy gap. GreenCo also seeks to act as a steppingstone to liquid national and regional power markets by complementing and leveraging the Southern African Power Pool whilst lowering costs, reducing pressure on utilities as well as fiscal liabilities on governments. Ms Hadjuka said GreenCo offers a PPP business model and is an enterprise which will be embedded in the local electricity sector and will be able to take practical steps to diversify and mitigate risk, catalysing sustainable structural market change, and supporting electricity sector development in a way that pure financial instruments from abroad cannot. Ian Cruz, Global Director P4G presented GreenCo as one of the most promising partnerships in 2019 and called for other partners in the public and private sector to accelerate GreenCo’s implementation in Zambia and the SADC region because of their strong case. “We are here today because we are delivering on SDGs and think partnerships like Africa GreenCo play a critical role to drive system change “. Ian Cruz, Global Director P4G. Ambassador Mukwita said Zambia is determined to close the energy gap to stimulate economic growth as energy is crucial for running the wheels of the economy.